NFL Commissioner Roger Goodell is thinking about getting rid of kickoffs. Really? The very symbolism of starting something big may go away in the near future because of “safety concerns”. The hair-brained replacement scheme would involving the team who would normally kick off getting the ball on their own 35-yard-line, 4th down and 15, with the logic being that most teams would simply punt, which is “safer” (and far more boring) than a kickoff. Now, let’s put aside the Orwellian logic that there can be a 4th down without having a 1st, 2nd, and 3rd down. The real question is this – why is Goodell trying so desperately to destroy the game of football? for breast cancer awareness to the hard-line stance on the Saints bounty scandal, the latest mess brought on by Goodell. Today, former NFL commissioner Paul Tagliabue vacated all player discipline in the Saints scandal, including all suspensions and fines levied by Goodell. This comes nearly 80% through a season where a Super Bowl contender has been brought down to mediocrity, while their coach is serving a year long suspension. Goodell has constantly had his objectivity questioned on this issue (including by this column) and is currently being sued for defamation by Saints linebacker Jonathan Vilma. Goodell’s story was compelling when he became the ninth NFL commissioner in 2006. An unlikely story of perseverance, which started when he decided at a very early age that he wanted this job of commissioner which, at that time, had been held by visionary Pete Rozell for nearly three decades. 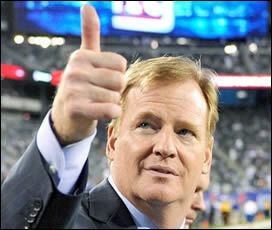 Unfortunately, Goodell has stepped far beyond his mandate, especially when it comes to the violent nature of the game. 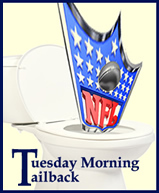 As we first discussed in the article The NFL – It’s a Big Hit!, Goodell operates on the belief that, as the most popular sport in America, the NFL has decided it has “a responsibility” to be the best – politically. But at the same time he is preening as a champion for safety, Goodell is pushing for two extra (18 total) regular season games. He has also rather cynically established Thursday night football all season on the league-owned NFL Network with the hope of soon selling the rights to another network. This means that teams routinely have to play games with only three days rest, vastly increasing potential injuries. Yes, there is hypocrisy here also.